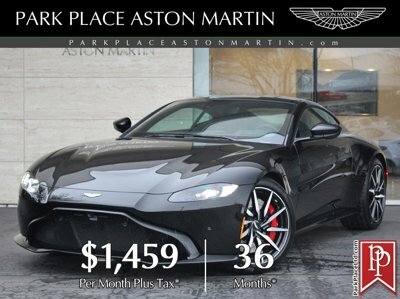 Among the Very First to Arrive in America, this Brand New 2019 Aston Martin Vantage is absolutely breathtaking! Finished in sleek Magnetic Silver over a cosseting interior that's tailored in the very finest Bridge of Weir leathers in a two-tone colour combination of Obsidian Black and Cream Truffle. Racetrack, winding country road or the everyday commute, Vantage is an Aston Martin of outstanding class, delivering a drive so intensely felt that it demands to be experienced time and time again. Like the archetypal hunter, everything has been finely tuned for a purpose. Sculptural forms create an athletic predatory stance, while muscular flanks and broad haunches express the agility and dynamism inherent to the car. It provocatively expresses the car's animalistic character in what is set to become an iconic symbol of performance. It produces that visceral Aston Martin roar. A rare breed and a statement of independence on the road, Vantage embodies all that is beautiful in our performance sports car range. A BORN PREDATOR - Vantage is raw and instinctive, unwavering in its singular purpose: to overwhelm the senses through its world-renowned design, agile performance, and dedicated craftsmanship. The heart of Vantage beats with a 503hp/505lb-ft 4.0-litre twin-turbocharged V8 engine. Impressive acceleration of 0-62 mph in 3.6 seconds and a speed of up to 195 mph deliver raw athleticism and an enticing performance feel. Factory Options for this sensational example consists of; Sports Plus Seat (Sport Plus Collection), 2 Seater Seating Arrangement, 10-Spoke Directional Gloss Black Diamond-Turned Wheels, Electric Steering Column, Sports Steering Wheel (Sport Plus Collection), Aston Martin Premium Audio, Tech Collection Package, Exterior Black Collection Package, Comfort Collection Package, Satin Carbon Fibre Twill Fascia Trim, Matte Black Front Grille Mesh, Dark Chrome Jewellery Pack, Roof Panel in Gloss Black, Ventilated Front Seats, Perforated Leather Seat Inserts, Embossed Wings, Aluminium Tread Plates, Under Bonnet Cross Brace in Black, Black Brake Calipers, Stainless Steel Exhaust Tailpipe Finisher, Painted Exterior Door Release Handle, Mirror Caps in Gloss Black, Side Gills in Exterior Body Colour, Second Jewellery Key, Bright Chrome (Green Wings Infill) Badge, First Aid Kit, Armrest (Closed Stowage), Seatbelts in Warm Charcoal, Black Boot Carpet, Umbrella.